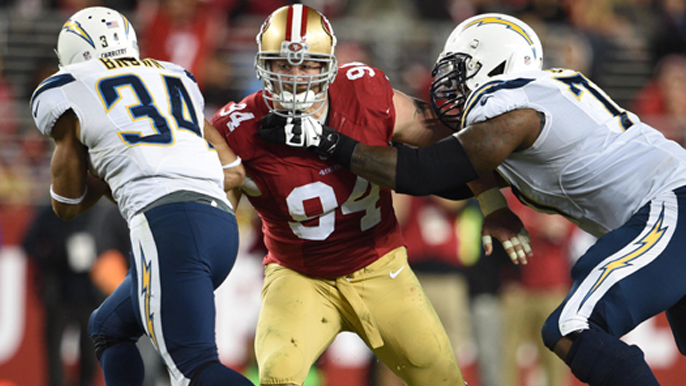 Justin Smith may one day have his number retired by the San Francisco 49ers. As of now, the former All-Pro defensive lineman’s No.94 is still available to be worn, however, and apparently will be next season by No.2 overall pick Solomon Thomas. It’s a big jersey to fill, something 49ers general manager John Lynch understands completely. In fact, before giving Thomas the number, Lynch called Smith to ask for his blessing. Another player known for laying the hammer is Smith’s former teammate Navorro Bowman, who after missing much of 2016 with an Achilles injury, is looking rejuvenated during training camp. Smith gave his two cents on if he thinks “Bo” can still be the force he once was. Listen to the full interview below. To hear Smith’s comments on Lynch, skip to the 2:20 mark.